Finding the right outfit for the big day can be a challenge and there are few days bigger than a US presidential inauguration. But America’s biggest designers have been strangely reticent about bringing their best frocks and suits to Trump Tower. Indeed, some have been positively resistant. None more vocally than Sophie Theallet, a designer whose work has benefited from her association with Michelle Obama over the last eight years. 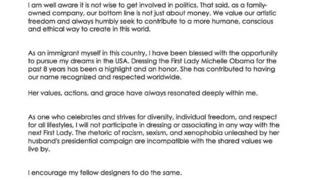 Her open letter to her fellow designers, where she declares that she “will not participate in dressing or associating with the next First Lady”, has become a lightning rod for an industry that vocally supported Hillary Clinton during the election. 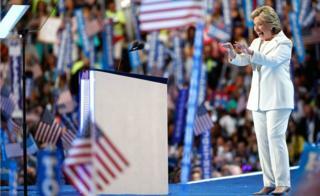 During the campaign much was made of Mrs Clinton’s relationship with Ralph Lauren, a brand built on a vision of US heritage that harks back to a time when America was great. Whereas the designer was apparently comfortable being associated with Mrs Clinton’s trouser suit obsession, the jumpsuit Mrs Trump wore on election night was was bought off the rack, according to the brand. Michelle Obama has been a strong supporter of domestic designers and brands during her eight years as First Lady, mixing high fashion (Jason Wu, Maria Pinto) with High Street (J Crew, Target) to promote the industry and the values of Made in America. Her choice of outfits gained her a reputation as a consummate diplomatic dresser and saw designers willing to offer up their finery to her. 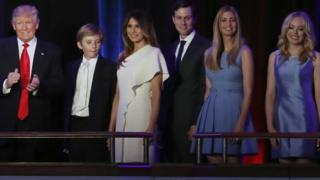 Given the prestige associated with dressing the First Lady, it is notable that Mrs Trump has bought many of her most notable outfits at retail and has been associated with European designers so far – think of the infamous Gucci (Italy) pussycat bow blouse from the debates, or the Roksanda Ilinic (Serbia via UK) dress she wore for her Republican convention speech. An estimated $250bn (£203bn) is spent annually on fashion in the US, according to a 2015 Joint Economic Committee report, and the fashion industry employs 1.9m people across the country. One of Mr Trump’s key messages was bringing industry back to America and, with “reshoring” of production a continuing trend, fashion could be a good place for the president-elect to start. 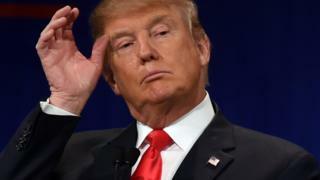 Being seen not to back American businesses in an area of his presidency which is open to daily scrutiny would give his critics an easy opportunity to attack. The Washington Post checked on where Trump’s own brand goods were manufactured and found that some of his fashion lines carried labels indicating that they were manufactured outside of the US. 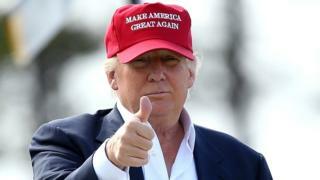 They did find that his trademark “Make America Great Again” cap was “Proudly Made in USA”. Hats off to him for that. And who is Mr Trump wearing? There is a long tradition, dating back to Eisenhower, of presidents choosing American-made suits in office. But Mr Trump is definitely not a man given to tradition or convention. His taste is for the luxury of the Italian Brioni label, which supplied his suits for The Apprentice – Mr Trump is now a paying customer. The choice of high price tag suits, an excess which may once have been counted against a candidate, did no harm to the president-elect during the campaign. 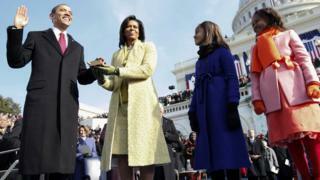 Barack Obama chose Chicago tailor Hart Schaffner Marx for his inauguration in 2009, sending a strong message about both his connection to the city and to Union-made goods. Will native New Yorker Mr Trump make a similar statement on his big day?